✔ Ideal for gardens, parks, backyards, porches and patios etc. ✔ Coated with spraying powder paint and wrought iron in bronze. ✔ Easy to assemble by a adults under manual with tools included. ✔ It is clearly weather resistant, rust resistant and fade resistant. ✔ Curved design of the seat and arm rest will allow you to sit comfortably. ✔ For those who appreciate a classic design, this is the perfect swing choice. ✔ When it gets dirty you can clean it by washing it down with a hose or wash cloth. ✔ We purchase our products directly from the manufacturer, so you're getting the best prices available. ✔ A porch swing is a delightfully charming addition to any home and brings a relaxed sense of peace to the scene. 【Heavy Duty & Sturdy】Comes with 4 chains, built in solid structure holds high capacity up to 551Lb. No problems hold 2 person to enjoy your leisure time. 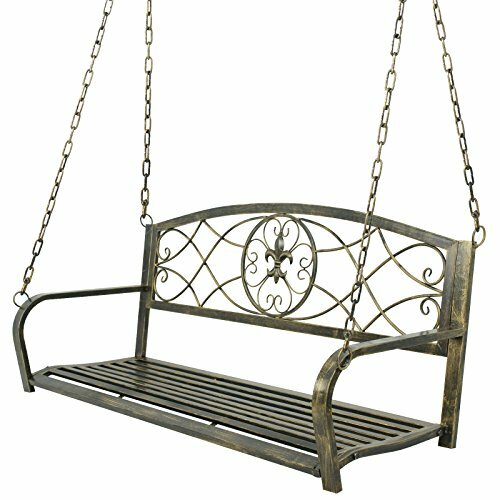 【Stylish Design】With eye-catching fleur-de-lis british rural style design on the backrest.This swing coated with spraying powder paint and wrought iron in bronze will complement your outdoor furniture setting. 【Comfortable & Functional】 This seat is a pleasure to sit or swing in either on its own or with your own cushions or pillows. It is also weighted just right so it will not blow away or move around a lot during windy days. 【Warranty】1 year---Missing parts or need replacement parts? contact our Customer Service Dept.